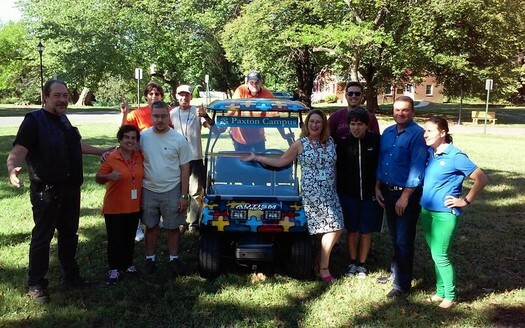 Helping out the Paxton Campus, Custom golf cart! 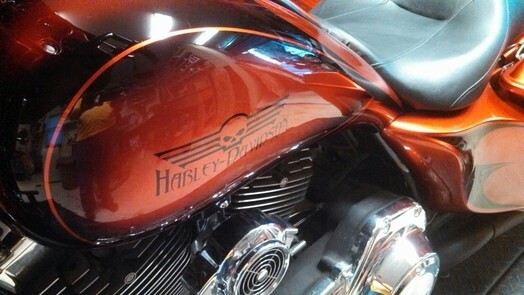 Motorcycle service, motorcycle repair, motorcycle restoration, motorcycle custom building, Air brush Illustration, Custom motorcycle paint work, powder-coating, Chrome plating, Ceramic coating, motorcycle Engine rebuilding, LED lighting, Power commander programming, and much more are available from our full service shop. Primary fluid, transmission fluid, Brake fluid and Oil changes, tire mounting, Drive line modification, Suspension and frame geometry, laser alignment and computer wheel balancing. Fully equipped to do all the work on your bike, CCS can restore antique bikes, modify choppers, repair accident damage, fabricate, weld and show polish. 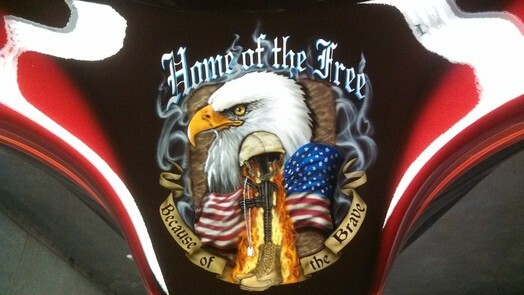 Drive your bike in and drive it away custom painted, restored, rebuilt or repaired and with a full year warranty. We offer V-Twin parts, S&S High Performance parts, PPG and House of Kolor finishes, Tires to exhaust, Fenders, tanks, frames, custom builds, Power Commander Programming, oscilloscope diagnostics, digital balancing, wheel lacing truing, as well as old school mechanical techniques. CCS can powder coat your parts using infrared technology and the latest in powder-coat technology, Flat, high gloss, wrinkle, color or pearl powder-coat finishes create that custom look and durability when we build or restore motorcycles, all exactly to your specifications. We can take any of the parts you have, and chrome plate them. We also nickel plate parts for accurate restorations. We use the best in Copper-Nickel-Chrome system which is polished to a mirror finish. Full disassembly press, bead and sand blasting are done to ensure the finish is perfect. We will take extremely good care of your show polished or chrome wheels with our rim-lock tire mounter. It is equipped with soft jaws, Teflon sliders and adapters to accommodate all extra-wide wheels, custom pulley and brake assemblies. Our digital computer wheel balancing ensures perfect balance done with chrome weights which match your wheels. After all, the wheels are the one thing which delivers the power to the road. Wheel bearings are cleaned, repacked with high temp marine grade grease and bearing seals are replaced. Rotors are checked for true, spokes are tuned, and all of this is done here in our shop. Part striping, new tanks, rust removal and removal of welding slag is accomplished with our sand blasting cabinet. Any good finish starts with proper substrate preparation. No job ends up right if it isn't built on a foundation of quality work. None of our body work is ever done on the steel. We always epoxy prime the substrate first. This ensures a life-time bond and prevents any issues with fuel lifting of the paintwork. Skim coats are applied over all body work to completely eliminate any surface definition problems once show polished. Fuel injection, carburetion, exhaust and engine modifications all play a part in final engine tuning. Our Power commander programming and oscilloscope diagnostics and comprehensive tuning methods can ensure all the horse-power and torque is delivered with smooth precision. S&S, Rev-Tech and other high end engines require expert technical experience we can provide. Fuel tanks are fully inspected. nothing could be more important to your carburetor or fuel injection system. We use the best in durable sealing methods. The Caswell fuel tank sealer system begins with a full rust removal system, stopping any rust dead in it's tracks permanently. The extremely durable sealer will never flake or lift like the old cream coat systems or radiator repair shop goop. Once done it will never need to be done again. Frame geometry is critical to a good ride. Suspension travel, rebound, lowering, rake and trail are all important to your riding result. Custom Cycle Studio will fully review your ideas, your bike or build and recommend changes and modification which work. Six speed transmissions, High Performance Engines, Primary and final Belt-Drives, and over-all gearing changes are also available at Custom Cycle Studio. Speedo healers and calibration of Dakota Digital speedometers make sure the job is complete. Any change in gearing must be fully considered, developed and installed with starter, torque, horsepower and longevity in mind. We install S&S super sidewinder 124 Cu. In. engines which bring twice the original power to your bike, and everything from the front out-put shaft, primary drive, clutch, transmission, rear drive and starter must be up to the task. We can install chain drive modifications, and Flextin Belt drives which will hold up to the 140 and more, horsepower engines available today. If you are really into making a real impression, our shop s fully equipped and experienced in this as well as nitrous aspiration. Electrical diagnostics can be one of the things which will make or break a bike job. We are fully equipped to diagnose electrical problems. We are able to fabricate and repair wire harness, handlebar wiring through the bars, lighting, ignitions, fuel-injection systems, LED systems, and even install special affect lighting. Battery and charging systems, starter and ignition systems all need to work right or even the best looking bike is no good at all. Proper fusing and stator up grades are often needed when engine up-grades are added in. When we install a high torque starter, the electrical system is modified to match. Comprehensive self adapting S&S ignition systems which adjust engine timing to the grade of fuel in your tank automatically, and even breaker point ignition systems are all fully understood and available here at Custom Cycle Studio. All work is given a one year satisfaction warranty. 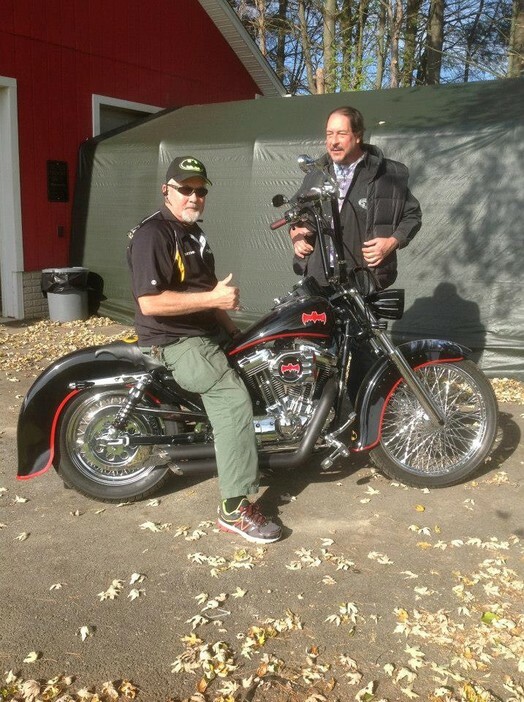 e-mail us at customcyclestudio@comcast.net for an estimate!